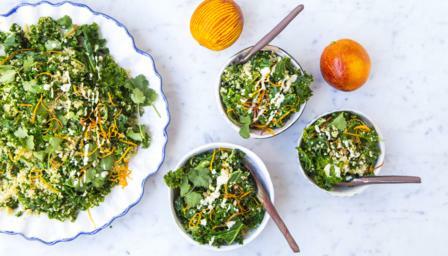 Hemsley and Hemsley’s quick and easy warm kale salad makes for a fantastic and healthy vegan meal. This meal provides 464 kcal, 19g protein, 48g carbohydrate (of which 7g sugars), 22g fat (of which 4g saturates), 7g fibre and 0.3g salt per portion. Put the quinoa in a bowl and cover with approximately 700ml/1¼ pints cold water. Set aside to soak overnight (or for at least 8 hours). Drain the quinoa and transfer to a very large saucepan. Cover with 350ml/12fl oz water and bring to the boil. Reduce the heat and simmer for 10-12 minutes, or until the quinoa is tender. Drain the quinoa and put in a large mixing bowl. Drizzle over the olive oil and season with sea salt. Meanwhile, for the dressing, whisk together all of the dressing ingredients until smooth, creamy and well combined, adding a splash of warm water to loosen the mixture if necessary. Season with pepper. Set aside. Heat the coconut oil in a frying pan over a medium heat until melted. Add the kale and stir-fry for 1-2 minutes, adding the garlic after 1 minute. Continue to fry until the kale is just tender, then tip it into the quinoa and stir to combine. To serve, divide the kale and quinoa sauté equally among 4 plates, garnish with the orange zest. Drizzle over the tahini dressing and scatter over the herbs.